Unlike the pumpkin-pecan pie from last week that was next to impossible to make look pretty, Linzer Sablé cookies are off-the-baking-rack pretty. 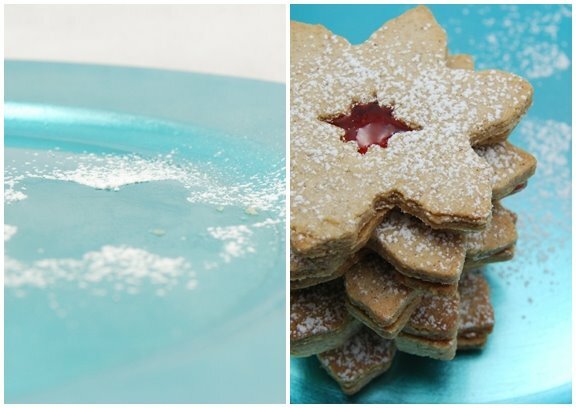 Marye from Baking Delights listed Dorie's Linzer Sablés as one of the 50 best recipes for Christmas on the internet. Linzer Sablés are the cookie version of the Linzertorte. Made with ground nuts (in my case ground almonds) and a filling of preserves. I used some homemade strawberry-rhubarb jam from my pantry to fill the middle. Sablés are a French butter cookie. Sablés means "sand" in French and refers to the sandy texture of this delicate and crumbly shortbread-like cookie. Cutout cookies are definitely more fussy and time-consuming, but the best tip for making cutout cookies comes from Dorie: use a freezer bag to roll the dough in. This tip is in the directions of her brown sugar-pecan shortbread cookies on page 127. I used to use a Silpat, but I've made some cuts in the Silpat in the process. For this recipe, I used two freezer bags. After I cut the bag open, I just rolled the remaining dough between the two sides of the bag. I rolled the cookies pretty thin, so they didn't need to be in the oven as long (9-10 minutes for mine). I like them crunchy, but if you prefer them softer, you could roll them thicker or bake them for less time. Another important tip is to refrigerate the dough before rolling, and optionally after cutting out so that they don't spread too much when baking. You can find the recipe for Linzer Sablés in the book Baking: From My Home to Yours by Dorie Greenspan or here. To see how the rest of the TWD group fared with this week's recipe, click here and then click on each blogger! Thanks to Noskos of Living the Life who chose the recipe for this week and will post the recipe. I loved these cookies and one of my daughters gave them a thumbs up too. The hint of cinnamon and cloves make them extra tasty. This recipe is definitely being added to my yearly Christmas cookie list. Grandma’s All-Occasion Sugar Cookies on pages 146-147 chosen by Ulrike of Küchenlatein. • This article gives you some ideas for decorating cutout cookies without the fuss. 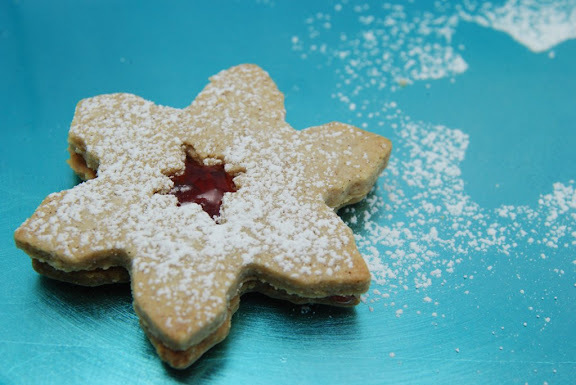 • Here's a pretty linzer cookie. 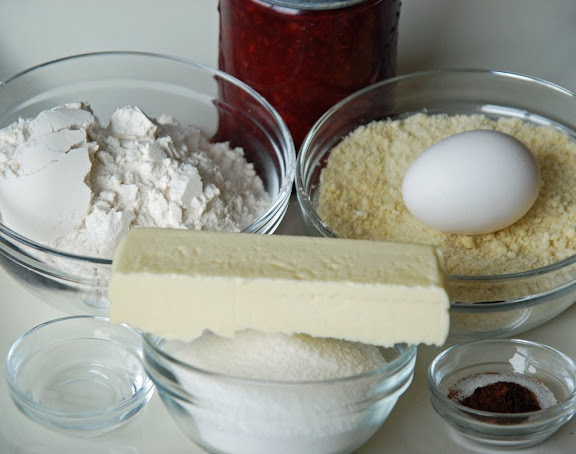 • This post gives an idea about how to make quick linzer cookies. Those are just so pretty! I should have remembered the ziploc bag trick - it really is a good one. Gorgeous cookies and photos! They turned out perfectly! Ciao Shari ! incredibly my children ate the sables too !! Yours look delicious ! The rolling out in a plastic bag tip is excellent. Your cookies look beautiful - I think almonds are the way to go with this recipe. Your cookies look lovely. And thanks for the great tip! Star shape... very christmasy! Good job, they look very, very good! I love the snowflake shape! They are very pretty! Gorgeous photos, I love the start cut out! Your linzer sables look perfect. I love the snowflakes. They're perfect for the dusting of powdered sugar. Very very pretty!! And a big thank you for not making them shaped like the nativity, complete with flying angels and wisemen. Or like Sanata and all 400 of his reindeer, and rydolph with a glowing nose. You made them lok like cookies. Whew. I want to get with you about spun sugar though - I MUST KNOW HOW! Those look just beautiful. I never remember the bag trick. I will next time! Your linzer cookies look great!! And yummy! great trick with the plastic bag! hopefully i'll remember it ;) your snowflakes are gorgeous! 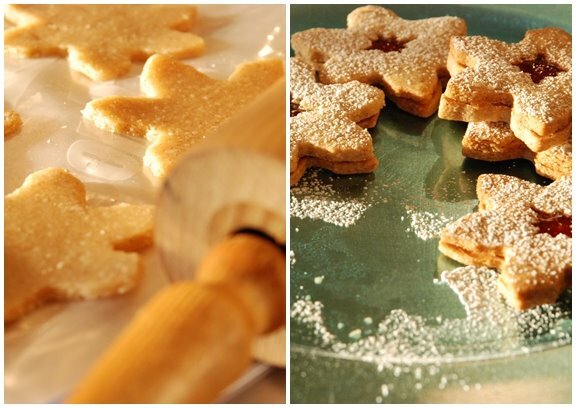 lovely linzer snowflakes! good tip with the freezer bag! Very clever, using those freezer bags! Very pretty, I love blue and white for Christmas. We loved the spices too, they were a nice touch. These are such pretty cookies and your jam sounds fantastic. I didn't chill the dough before rolling and had no trouble, and though I loved the rolling between waxed paper, I think a ziploc would be even better. Very beautiful! I love the shapes you chose...they look so elegant and I can just see them being the star of a Christmas cookie tray! Wow...very nice. I loved these, too! And I'm making note of the ziplock bag idea...tho I thought this was a lovely dough to work with. Beautiful cookies - I love the snowflake look, perfect for the season. D'oh!!! --- I totally fogot about the ziploc tip. This dough was a bit sticky, so the ziplocs would have come in handy at my house. Absolutely gorgeous pictures! Happy holidays! Wow, never thought of rolling them out in ziploc bags... very cool! Yours look wonderful and your photos are so nice. Thanks for the plastic bag tip I will have to remember that next time I bake these. These are going on our Christmas cookie list, too! Yours are beautiful, and your pictures are stunning as always. Glad you enjoyed these! Lovely! And strawberry-rhubarb. I'm dying of jealousy. 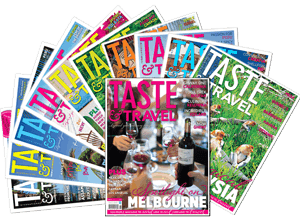 I have had a time trying to get in to your blog to leave a comment! It may be something on my end but it would not load. At any rate, here I am now! Your cookies are gorgeous of course. You are such an inspiration to me with your photos also. And that salmon looks delicious! I didn't have any trouble rolling with the waxed paper, but the plastic bag sounds like a great idea too. Love your photos. Your cookies look really yummy. These cookies really are textbook pretty. It's a good thing they taste good too. Very pretty cookies. I agree the secret is in the chilling. I have found just going straight to the freezer makes the dough much easier to work with and keeps the shape of the cookie crisper or neater. You cutter shape is lovely. I absolutely love these cookies! They were a huge hit at my family's house as well (I also filled some with chocolate, yum). Beautiful, wintery photos! They look beautiful- I really like your tips as well. 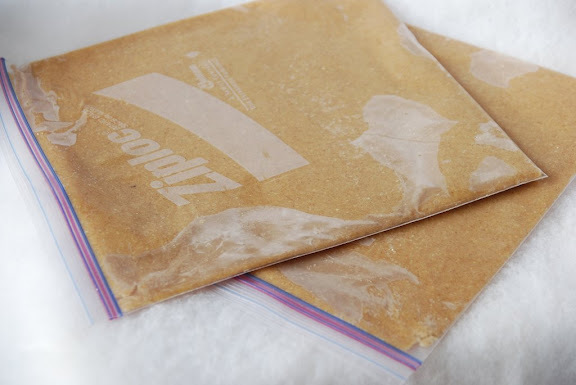 I have only used the Ziploc bag once, when I made the Brown Sugar Shortbread, but it was really helpful! I didn't know about the ziploc bag trick. I wasn't a member when you made the Brown Sugar Shortbread, so thanks for mentioning it. Your cookies look beautiful and your photos are amazing! Sorry I didn't get to bake this week as your cookies look amazing! I'll have to catch up when I return from Chicago. The cookies turned out great, and I'd forgotten about that freezer bag tip! I love all of your photos! They are gorgeous! I will use the ziploc tip the next time I make cookies. 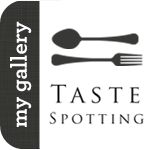 Yours look great and I love your pictures! Pretty linzers. Love the opening shot with the 'negative' cookie imprint. I have GOT to try these.